Well, that was a lot of work. After honing my acrylic manipulation skills, I finally had to move on to another aspect of the build. 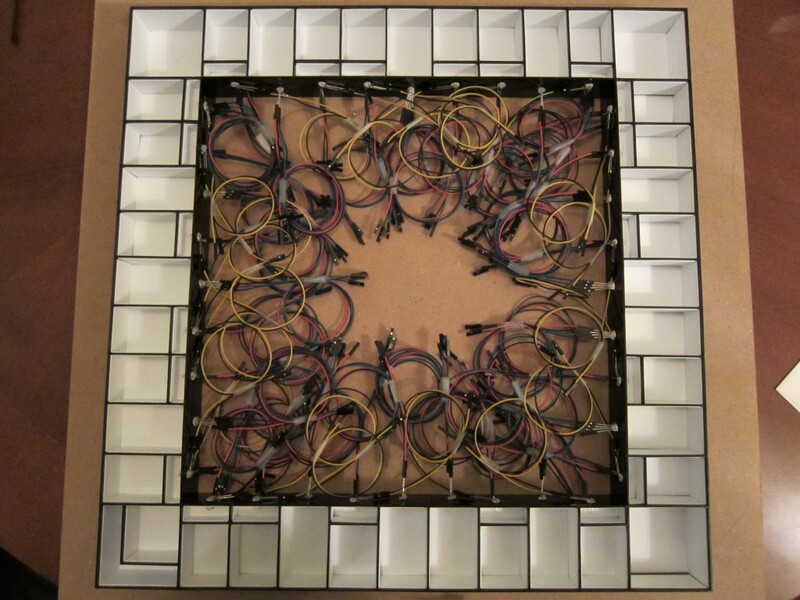 This weekend has been spent installing LEDs in the framework. For each LED, appropriate wires had to be attached first, then the LED attached by hot glue. I considered using an epoxy, but want the LEDs to be removable just in case one goes out. After putting in the initial batch of 26 RGB LEDs, I realized the wire management would quickly get, well, unmanageable. So, I added a step of coiling and taping each LED’s wires together. The whole process took a lot longer than I would have liked, and I haven’t even been able to test all the lights yet. Regardless, good progress. At this point, I may have to actually start working on the electronics again so I might be able to light them all up at once. Once that works, it’s on to test patterns. Starting to shape up!